Bills defensive coordinator Mike Pettine had a second interview with the Browns. CLEVELAND — The Browns’ coaching search could be nearing a conclusion. 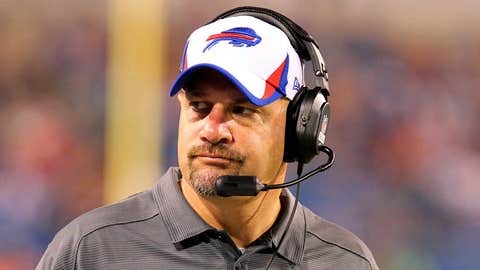 Team officials interviewed Buffalo defensive coordinator Mike Pettine for the second time on Tuesday night in Mobile, Ala., and although the sides did not reach a deal, the 47-year-old has emerged as the front-runner to become Cleveland’s seventh full-time coach. Pettine, who spent one season with the Bills after four on Rex Ryan’s staff with the New York Jets, told Cleveland.com that he "should have some feedback on my interview by the end of the day." The Browns are also expected to give Seattle defensive coordinator Dan Quinn a second interview. With the Seahawks getting ready for the Super Bowl, the Browns have to conduct that interview by Jan. 26. On Tuesday, Denver offensive coordinator Adam Gase withdrew his name from consideration for Cleveland’s opening.